Maxi Affiliates is the affiliate program for top converting Casino and Bingo brands. We boast affiliate friendly terms that include lifetime revenue share, no quotas, and no bundling. Maxi Affiliates currently boasts 4 Casino brands on the Progress Play platform. 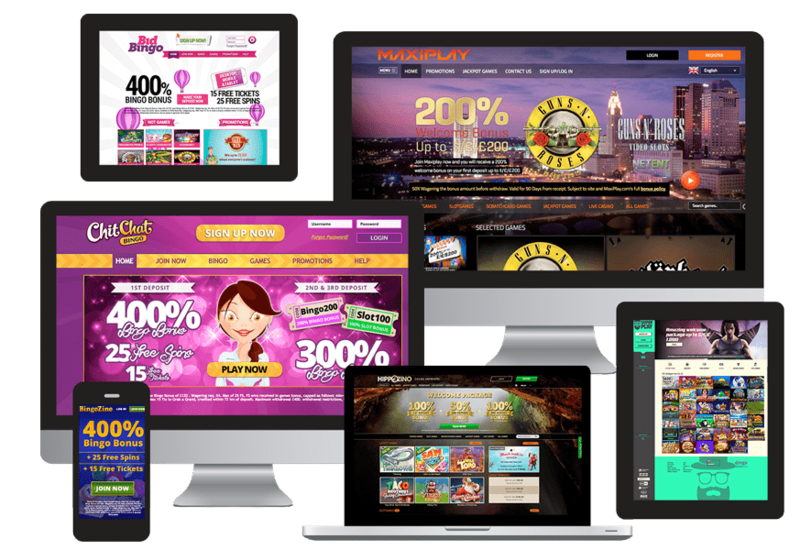 Compare our 3 Dragonfish Bingo sites including our multi award-winning Chit Chat Bingo Site. Your casino & bingo traffic gets quality licensed venues. The team at Maxi Affiliates has unrivalled experience in looking after & converting affiliate traffic into revenue. Join Us to make the most of your Casino & Bingo traffic. Maxi Affiliates uses advanced Affiliate tracking software. It offers affiliate partners total transparency & easy to use marketing and reporting tools. Powerful reporting means better-targeted campaigns. That means bigger profits for you. Take advantage of our innovative Bingo and Casino brands to turn clicks into cash. We know how to convert and retain players with our data focussed approach. The Maxi Affiliates Team are veterans of the industry and still remember the things that matter. Lifetime Revenue Share and No Quotas is part of the ethos. Join Us for the fairest division of earnings in the gambling industry. Enjoy proactive, dedicated account management. Utilise 30+ years of experience in the world of affiliate gambling to turn your clicks into cash. Get 50% Revenue Share in your 1st Month at Maxi Affiliates. Join our I Gaming Affiliate friendly program today. 25% of Rev Share is the base rate revenue share at Maxi Affiliates. Did we mention there is no negative carryover? Rev Share is for life. Refer a player to a Maxi Affiliate brand & get revenues for life. No Quotas, no un-friendly terms. A very fair, and lucrative hop to getting extra Net Revenue. Maximise your earnings at Maxi Affiliates. Affiliate friendly is what we are and this tier is a clear display of that affiliate friendly policy of ours. Get up to 45% at the most Affiliate friendly program online. Maxi Affiliates turns your clicks into cash. You are the Cream of The Crop - We love paying this Revshare as it Means we are all doing a good job!! We work with these amazing customers, join our team today and start earning money! Bid Bingo was originally Yahoo Bingo and is now available to UK Bingo players on the highly rated Dragonfish Platform. A fantastic conversion ratio with a nice clean site makes this an attractive destination for players. BingoZino offers a range if unique promotions and prizes to bingo players. Already a few years old, this popular bingo room remains popular with players now that it is on the Dragonfish platform. Chit Chat Bingo is the oldest and flagship of the 3 bingo brands on Maxi Affiliates. Newly released on the Dragonfish bingo platform with an aggressive sign up offer, take advantage of this brand to earn fantastic revenue. Hippozino Casino is a Progress Play Casino boasting 300+ Casino Games. Software providers include Microgaming & Net Entertainment. UK, Swedish and German Sites & Support. Mr SuperPlay Casino is a hip hot new age online casino. Check out the hipster Casino here and see how he can increase your earnings. Mr Jack Vegas is the neon themed Online Casino at Maxi Affiliates. Check out the amazing conversion ratios on Jack Vegas. What Maxi Affiliate partners have to say about working with us. Maxi Affiliates repertoire consists of some sweet-looking UK casinos that we're happy to have on Bojoko.com! British players can enjoy safe gambling on their casinos as they are fully licensed in the United Kingdom and Malta as well as getting a license in Sweden. Busy Bee Bingo highly recommends Maxi Affiliates. They offer some fantastic brands for both online bingo and casino fans. It is backed up by a professional and proactive team who have worked with us to help us maximise our alliance, assisting in a friendly and timely manner. The Online Casinos No Deposit Team have worked with MaxiPlay for a number of years and continue to do so because of key KPIs. Conversion is good and Account Management is better. Maxi Affiliates have helped us promote their casino brands in the best of ways. Professional, polite and always eager to help. Recommended partner! Tunf.com is really proud working with MAXI Affiliates. So far the results look promising. Professional team and always available to help. Maxi Affiliates provide us with brands that deliver great casino bonuses. If you are looking for high conversions and a solid partner Maxi is a top pick. Here at Boomtown Gaming, we have the pleasure of working with Maxi Affiliates. They are great to deal with and offer some of the highest converting brands in the industry. We've been super pleased with our collaboration with MaxiAffiliates so far. We appreciate how creative they are and how fast they meet our needs. This is definitely a professional team of affiliate managers and we sincerely recommend them to any affiliate. Working with Maxi Affiliates has been a great experience. Their brands convert very well and the tracking is flawless, which does not come as a surprise due to their professional affiliate team behind the scenes. We recommend them to all affiliates who are looking for quality casinos to promote. Maxi Affiliates is our go-to brand for bingo, the team and management of the program are not. With Affiliate friendly policies and realistic rev share hops, this is one of our top choices when looking to send traffic to a bingo brand. Working with Maxi Affiliates has been a pleasure since day one. A handful of solid brands, these guys have already distinguished themselves from their competitors with a no-nonsense attitude and a dedication to their field that’s not easily found. A really honest and helpful team of guys that genuinely do have the affiliates best interests in mind. Couldn’t recommend them enough! Although Maxi Affiliates are a relative newcomer in the Affiliate space, I know a number of the affiliate team members from previous affiliate venues and am happy to endorse and send traffic to their brands. Trust is a big issue these days; this is one trustworthy Affiliate friendly venue. Why should I join Maxi Affiliates? Maxi Affiliates is a new Affiliate friendly destination for Bingo & Casino Affiliates. There is the opportunity to earn commissions by promoting our Bingo & Casino brands. Join us and turn your clicks into cash with our highly rated established brands. What commissions do you offer? We offer a generous commission structure. Get 50% Rev Share for the first month. After that, the default commision structure is as follows. We do not carry over negatives. Being Affiliate friendly is part of our DNA, so this clause is standard. Yes, you would need a site. We are required by UKGC regulations to know about all marketing channels, and we expect all marketing channels to be listed. What payment methods are on offer? We offer a wide range of payment methods, with minimal thresholds. All affiliate commissions get paid before the 25th of each month. That means if you have earned funds in January, they will get paid by the 25th of February. Invoice Cut Off dates are the 15th of each month. As we are very approachable, there are a variety of contact methods. Email and Skype work best though, and these get found on our Contact Page. You can also contact us via the Contact page. Does my Site have to be compliant? Yes. All of our partner brands are UKGC licensed, and that means all of our partners must be compliant with all of the rules governing marketing to players. There is a zero tolerance policy in place re this.